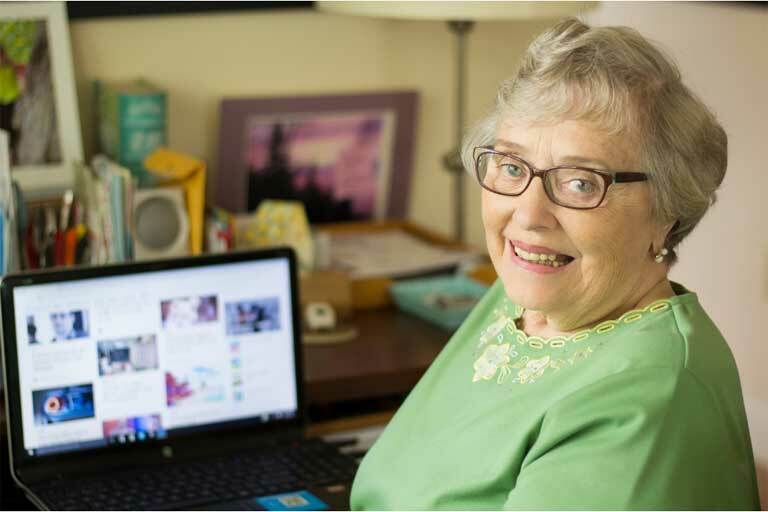 Margaret Christenson, an 82-year-old resident at The Bridge at Orlando, Florida, connects with the world around her by pursuing life with curiosity and passion. An avid learner, Christenson graduated from the University of Minnesota with her bachelor’s degree in occupational therapy in 1956. After marrying her husband, Carl, Christenson began working in long-term care. From an early age, Christenson was passionate about working in geriatrics. This sentiment never left Christenson’s mind, and after receiving her master’s in public health, she began to brainstorm ways to help the elderly modify their homes to create a safer environment. In 1980, Christenson founded Geriatric Environmental Concepts, a company designed to find practical home-like modifications for aging individuals. As her company grew, Christenson realized that technology could speed up the writing process and provide in-home accessibility to a much larger audience. With the expertise of her son, a local software developer, she began to design and write a software program, which was later successfully alpha and beta tested. The company’s name was changed to Lifease©, and the first copy of the software sold in the fall of 1992. The program was so successful that the concept of the software is still used today. Though she no longer runs a company, Christenson is constantly engaging her mind and finding innovative solutions for her friends at The Bridge. When she noticed that a few residents couldn’t read the regular hymnals during a church service, she found a company online to send the facility large-print hymnals.